Label Bar Blog » What Are the Main Benefits of Identification Labels? What Are the Main Benefits of Identification Labels? Posted February 22, 2018 by Will Best & filed under Identification Labels. Identification labels have grown to become the preferred method of cataloguing and tracking of equipment and machinery in the workplace, be it an industrial workplace or an office workplace. Long gone have the days of archaic equipment tracking, often plagued by administrative human errors. Identification Labels require very little manual input; many ID labels supplied here at Label Bar can be scanned and tracked on computer software without the need for regular manual information updates. Below you’ll find the most popular benefits of identification labels and how they can help your business move into the 21st century. 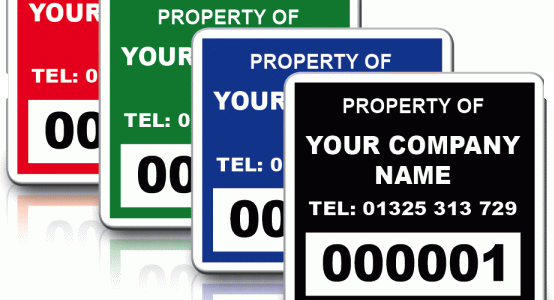 ID stickers can help businesses easily track their equipment, simply with a scan of a barcode. Being able to track equipment reduces losses and potential equipment replacement costs. It can be frustrating to have equipment move from one work area to another, but with regular equipment tracking, misplaced items can be found with ease. With the simple act of labelling and scanning a barcode, you can ensure your business keeps specific pieces of equipment in specific locations. They can also help if an employee has misplaced an item such as a laptop or a work tablet; if one has been found it can be scanned and linked to a specific employee instantly. Because of their customisable nature, ID stickers can be adapted to fit your company, including name, address, email details, phone contact details and in some cases, can be adorned with your company logo and colour scheme. This makes an item easily associated with your company if it has been lost and it can also give someone the opportunity to contact you if an item is found. This customisation option can also go some way to dissuade potential thieves from taking your equipment; if an item is adorned with a barcode it can act as a great deterrent as it shows your items can be easily tracked if they are stolen. Being able to keep a log of servicing and maintenance can be vital in saving on costly maintenance being accidentally replicated. With a simple scan of a barcode you can bring up your maintenance database and track previous work done to equipment, as well as seeing any recommended future fixes that may be required, or any hazards that need to be addressed. This also makes maintenance much more remote and flexible; servicing can be done in one location and simultaneously monitored real-time in another location, simply by having an identification Sticker that is scanned and linked to a database. It doesn’t matter whether your business is located all on one site or is mobile, with workers travelling across the country with valuable equipment, identification labels can safeguard your equipment whilst also keeping an up-to-date record of its working standard. Manual data entry and tracking is slowly but surely becoming a thing of the past, as technology advances and barcode technology becomes a much more affordable and time-effective solution to equipment tracking and identification. ID labels, especially barcoded labels, massively reduce manual errors whilst making all your products identifiable with professionally manufactured labels. If you’d like to learn more about the ID labels we supply please be sure to browse our website for a look at the products we currently have in stock. If you have any questions, please don’t hesitate to contact us here at Label Bar.